Yesterday morning, while having breakfast on the front porch, my attention was drawn to a 10-foot U-Haul parked across the street. As they say, the universe is always conspiring on our behalf, so pay attention to what is going on around you. Symbols appear for a reason. 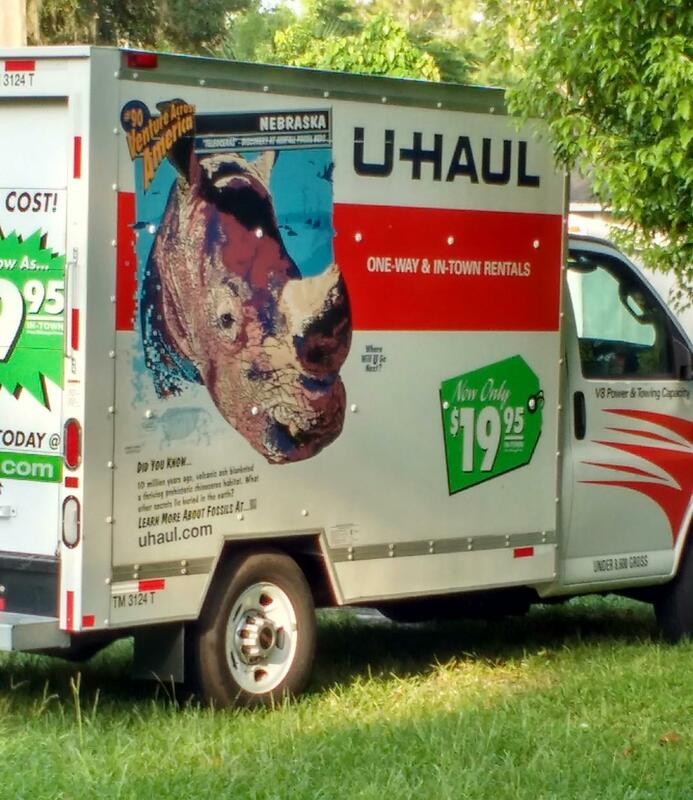 The hard nosed rhino on the side panel of the U-Haul seemed deliberate. It took me on a journey back in time. Rhino is a reminder to take charge of your life. To know yourself. Many years ago, rhino energy was what I needed to move from Virginia to Georgia. Instead of making plans, it was a time of letting go, and trusting the Holy Spirit to handle the details. To my surprise, things came together effortlessly when I got myself out of the way. My girl friend offered to help me out. She would drive a rental truck to Richmond where I would meet up with my niece who was moving to Atlanta, too. My job was to rent the truck, have it packed, and ready to go the next morning. I gulped. Me drive a truck! I had no choice. I had to do it...AFRAID. I signed the lease at the U-Haul Rental Depot and nervously climbed up into cab of the 10-foot truck, just like the one above without the rhino mural. Driving a truck was always a big fear of mine; it seemed to be a manly job that required a chromosome I didn't have. For extra courage, I brought my guardian angel driving ornament from my Honda along on the undaunting trip. My sweaty hands were shaking as I aimed the key into the ignition. For company, I turned on the radio and slowly drove across the long U-Haul lot. The angels of laughter were at play. An amusing ad came on the radio just then, quipping: Don’t talk to me! I’m paying attention to my driving! I burst out laughing, feeling buckets of fear melt away. Merging in with traffic on busy Smoketown Road, my guardian angel ornament spun round, dangling from the truck's rear view mirror. White knuckled, I clutched the wheel for the longest five miles, but I did it. Or I should say, we did it! So whatever fears you may be facing today, please find comfort that you are in the midst of great celestial loving company. The angels are right there watching over you, just ask to feel their loving presence. I was so grateful for the reminder that all things are possible with God. God loves you.